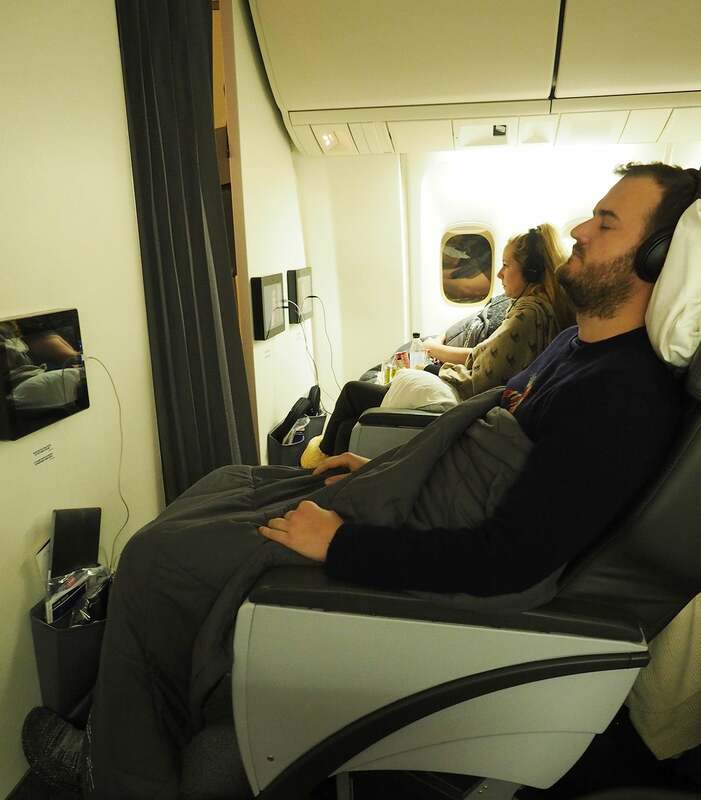 My flight between Reykjavik (KEF) and New York (JFK) in Icelandair Saga class felt like a premium economy experience, not a business class one. 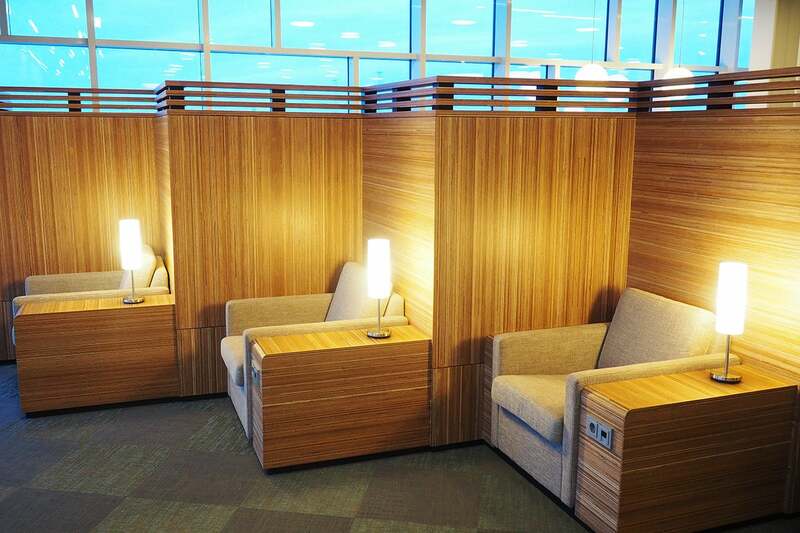 The pros: a nice Icelandair lounge and multiple daily flights. The cons: terrible food and small seats that barely recline. This past October, my friends and I decided we wanted to spend an epic New Year’s Eve in Iceland. With so many new flights headed to Iceland from the US, I figured I’d have plenty of options to choose from. 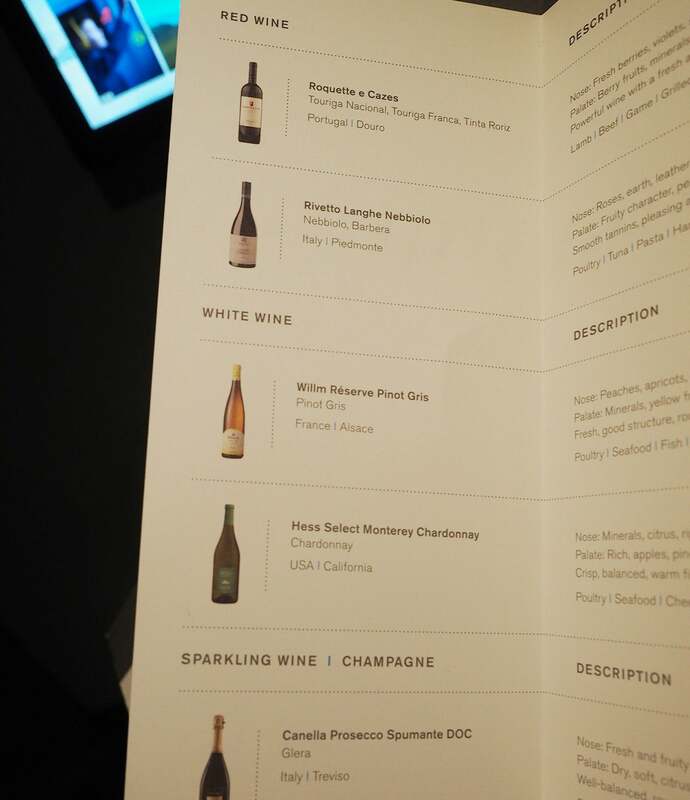 Once I started looking, I realized that Delta already was sold out in business class during the busy holiday dates and was only operating flights on certain days of the week, so they were out. Considering we here at TPG have determined that flying WOW Air ‘Biz’ class is comparable to staying in a youth hostel, I figured it was time to try out Icelandair’s Saga class even though I knew it wouldn’t be a lie-flat experience. Plus, the airline is launching new routes from Baltimore (BWI), San Francisco (SFO) and Kansas City (MCI) to Reykjavik (KEF), so I thought it was the right time to test the waters. I booked my flight between KEF and JFK for about $2,100. I used my Amex Platinum to pay, earning 5X points per dollar on airfare. Roundtrip flights on Delta were only a few hundred more, but as I said they were sold out in business class. The photos and review are from the return portion of my trip from Reykjavik (KEF) to New York (JFK). 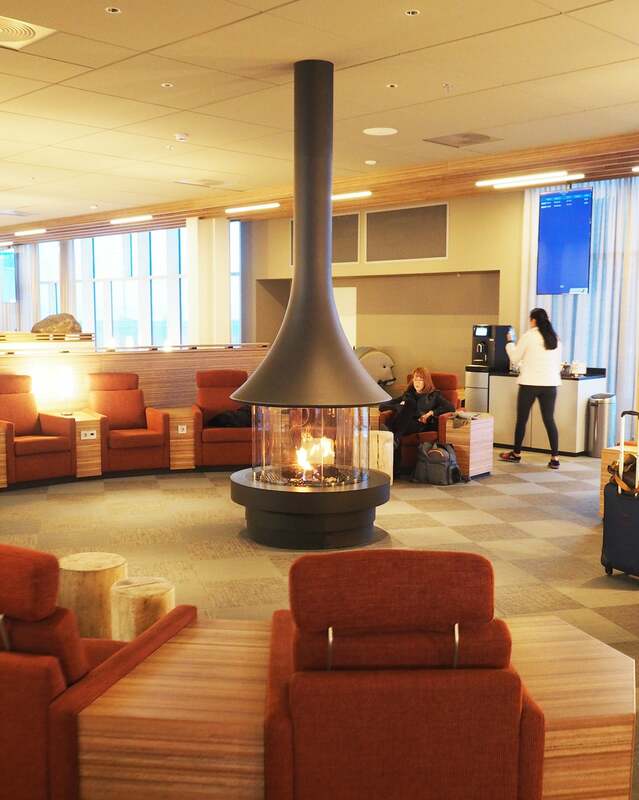 I had some time before boarding to check out the Icelandair Lounge at the Reykjavik airport, and this was actually the best part of the Icelandair experience. The space was sleek, with wood floors and wood panels. The armchairs were comfortable, and I loved how the lounge seemed stylish, yet cozy at the same time with a fireplace in the middle. The Nordics really know their hygge! I’m glad I ate some food in the lounge because I’d later realize the in-flight food would be very underwhelming. 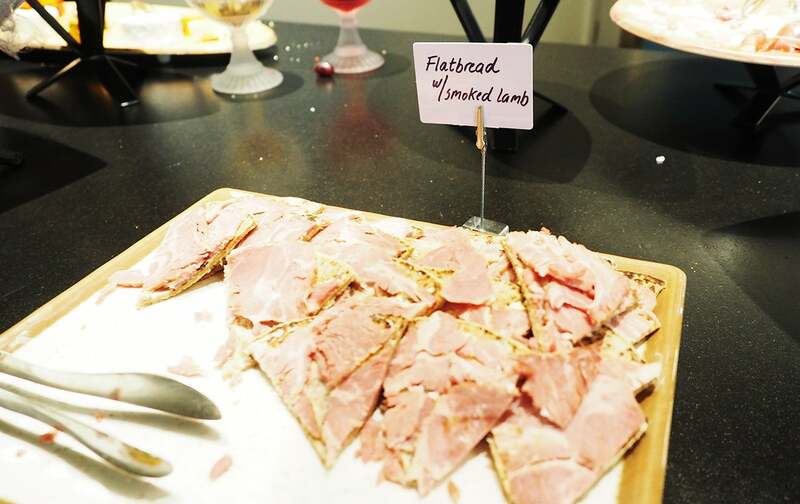 The spread was enticing and included items like vegetable patties and roasted lamb on flatbread. 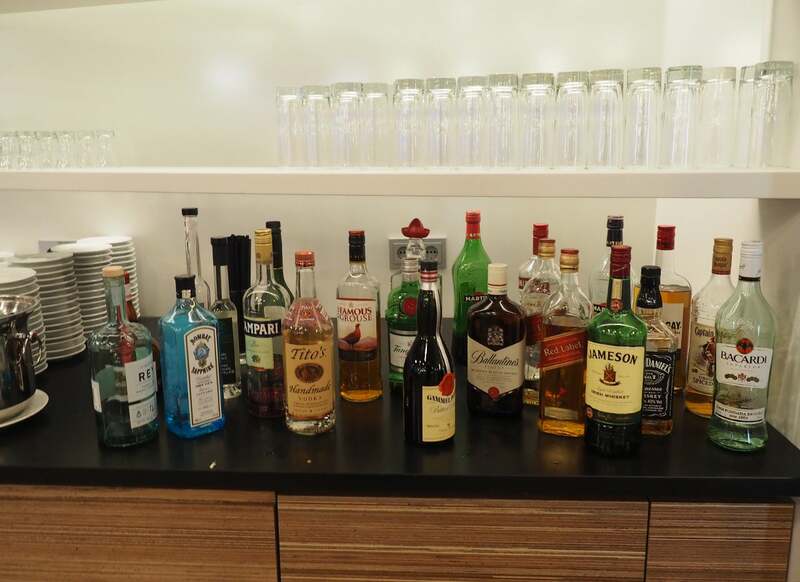 A full bar with alcohol was available as well as soft drinks and water. I would later need this sustenance (and booze) to survive the boarding process. Boarding was a mess, with very little organization. The gate was jam-packed, and there wasn’t a call for any type of pre-boarding for priority passengers, which was annoying. I was frazzled after shoving past the crowds to board, but luckily I’d at least had a calming experience in the lounge to prepare me for the madness. 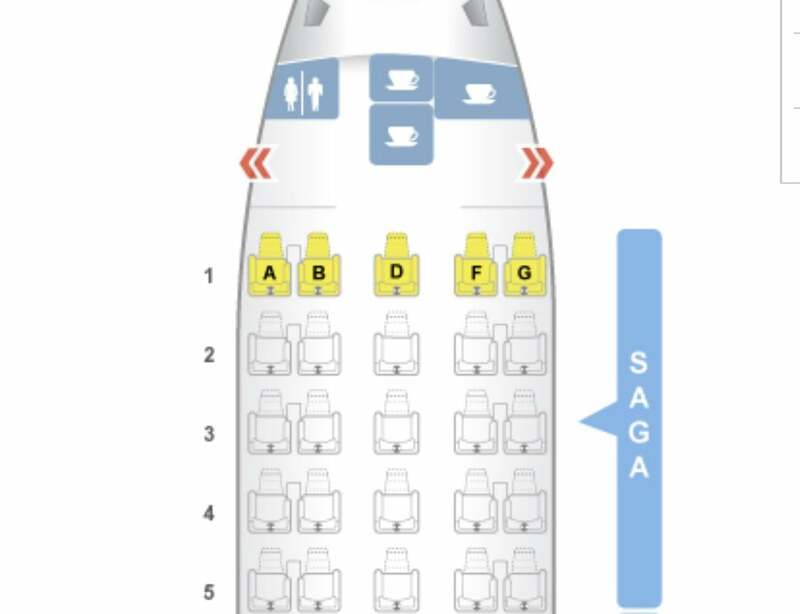 Icelandair Saga class had 25 recliner seats with a unique 2-1-2 configuration, meaning my four friends and I could all sit in the same row. If sitting five-across in our own business class row isn’t #squadgoals, I don’t know what is! Saga: a long story of heroic achievement, especially a medieval prose narrative in Old Norse or Old Icelandic. I selected the ‘middle’ solo seat and let my friends have the seats on either side in pairs. I chose the bulkhead row in hopes of no one reclining into me, but there really wasn’t much legroom in the bulkhead anyway, and the seats reminded me of domestic first class. They were larger than economy seats and reclined slightly further, but that was it. The pitch of the Saga seats was 40 inches, and the width 20. 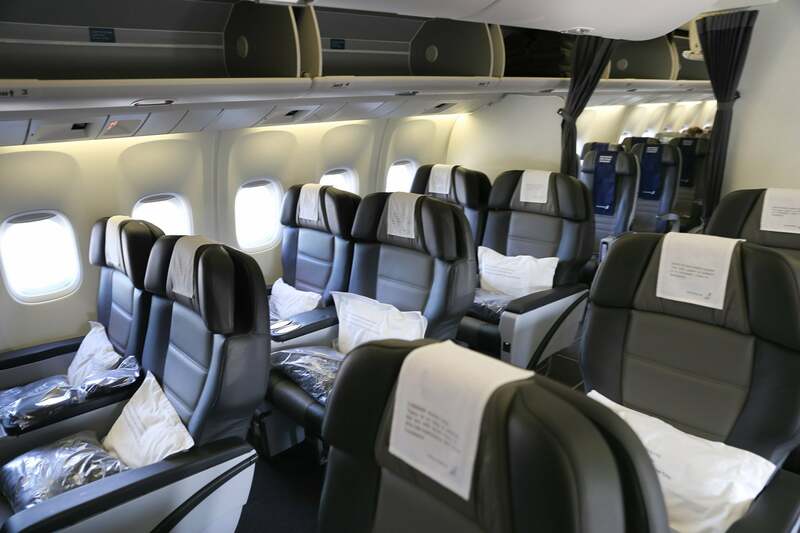 The economy comfort section had 18 seats, each with a pitch of 33 inches and a width of 17, and the regular economy cabin had 215 seats, each with a pitch of 32 inches and a width of 17. I was relieved I’d snacked in the lounge, because the food was really underwhelming. The only options were a grilled rack of lamb or a seafood bouillabaisse. 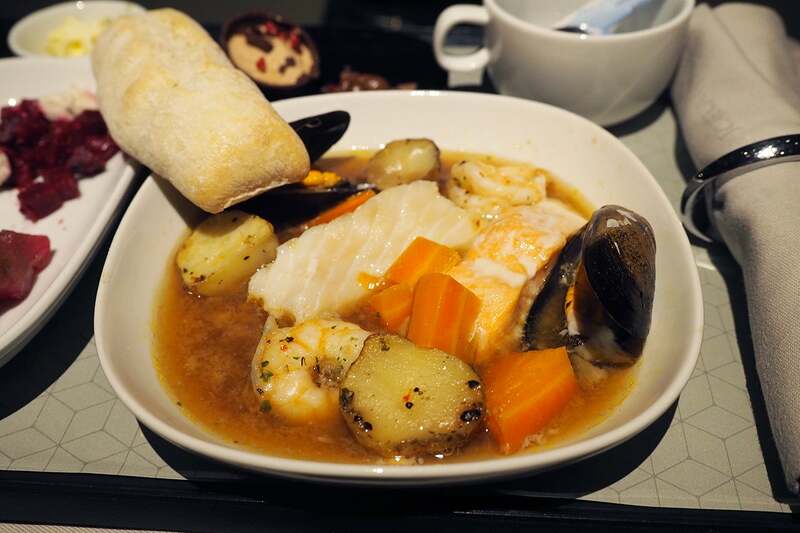 I don’t normally order seafood on planes, but I really wasn’t in the mood for a heavy lamb dish, so I went with the bouillabaisse, and it was simply average. There was only one dessert, a chocolate mousse, and there wasn’t champagne (forget about caviar!) — just some ultra-sweet prosecco. The in-flight entertainment was extremely basic, with 49 total movies and a USB port. The flight attendants were friendly, though, and there was free Wi-Fi for Saga passengers. 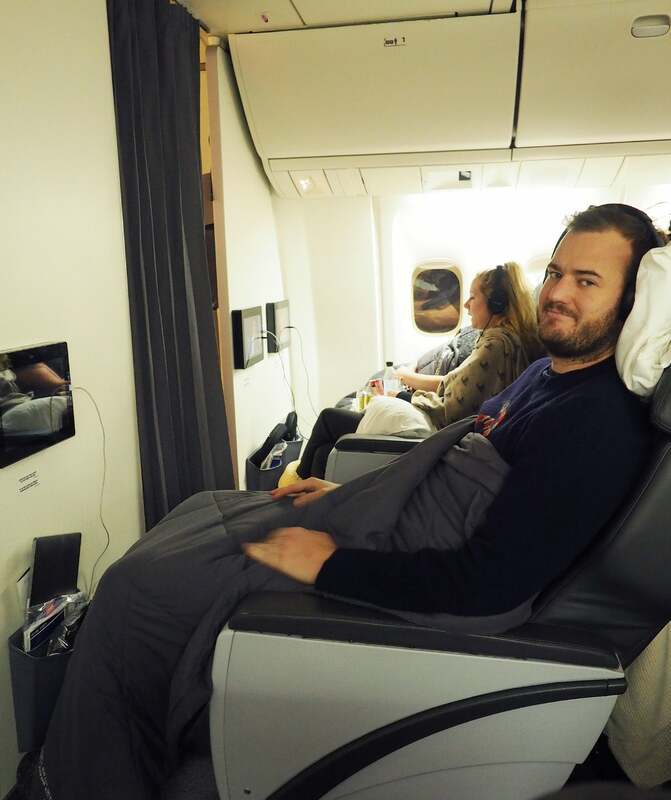 TPG assistant editor Brendan Dorsey liked his experience in Icelandair economy in October of 2017, but the Saga class experience just felt very bare bones to me. It isn’t what I would expect from a business class at all. Norwegian Premium is much better, and I’m apt to say that Icelandair should either up their game or Saga should not be labeled a business class — there was more legroom in bulkhead economy than in Saga! 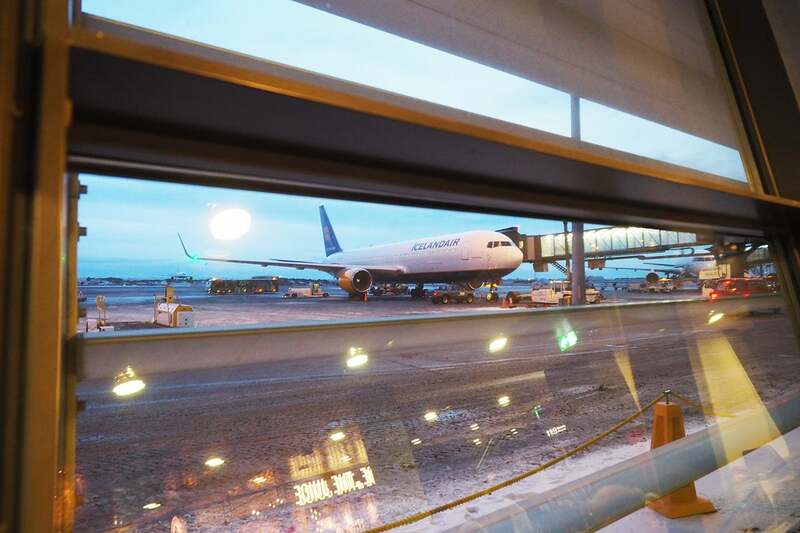 The flight was only five-and-a-half hours, and Icelandair does offer daily flights. If it fit my schedule, I’d fly this route and class again, but it definitely wouldn’t be my first choice. If you fly this route, make sure to get to the lounge beforehand! All images by author except where noted. Featured image by Brendan Dorsey.